So Suzy's classes were fabulous today!!! The lady is just so fantastic and she can keep a class hopping. A half hour doesn't go by that she's not standing on a table. Her last class is tomorrow morning at 10:00 am there are still some spots left for any of you procrastinators. Tonight we headed to old Montreal. Suzy loved what she saw of our beautiful city. We took a bunch of pictures which I will post when she sends them to me. Well we have an early class so 'night. ok, so I just got home from a full day spent with Suzy. All I can say is "what a genuinely nice and good person she is! and so much fun to be with too." I think that all the ladies who took her class tonight will agree with me when I say that she gives a great class and she can liven up a room without any difficulty. If you have a chance to come by and meet her you should. She's just one of those people that it's a delight to get to know. So, I picked Suzy up at the airport today and all I can say is WOW!! She is just a remarkable lady. So talented and full of energy and great ideas. I got to see all her samples for the classes and they are awesome!!!! I may have to attend each of the classes as a student. Each page is nicer than the next. This lady is a very highly demanded, well respected , very popular woman in the scrapbooking industry. She started her scrapbook business in her garage and in her time there had the likes of Becky Higgins, Cathy Z., Lisa B., Ali Edwards, etc...all scrapbook there. I am thinking that this Friday's crop is going to be like none we've had before. And it could be a start of a new fashion of crops at Scrapbook Centrale. Suzy's loaded with great ideas and suggestions, I hope to learn as much from her as a previous store owner as her students do from her as a teacher. Make sure to come by the store Thursday and/or Friday between 11:30 and 1:30 and say hello to her, you can see for yourself what a wonderful lady she is. I hope everyone got our e-mail about the Truckload Sale we are hosting this weekend. One of our distributors is bringing a truckload of products to sell at ridiculously reduced prices.This will be starting Sunday at noon and continuing all the way to Tuesday at closing. Even I am curious what's going to be there. Lots more Prima has arrived. The packs of hydrangeas are really nice. The colors are beautiful. For those of you that have been wanting a big shot, have I got a deal for you! I received 6 (2 sold already) big shots that I will be offering on promo at a rate of $89.95. The last time I had them in stock they were 129.95. That's quite a savings. This offer is while supplies last only. Also the new Texture Boutique mchine also just arrived. This is an embossing machine. It will not cut but it embosses using all those wondeful embossing folders we all love. This is perfect for the person who loves the look of embossing but can't justify buying a die cutting machine as they won't use it, then this is the perfect solution. Best news it is only $35.95 How great is that, oh and did I mention how cute it is. With this came about 10 new sets of embossing folders. They are really nice. We do have one texture boutique that will be available for demonstrations and will be left in the crop room for croppers. ok, so boxes keep arriving daily. our shelves are full!!!! and Jillibean Soup. They have a great basics line with a grid like pattern on one side and a polkadot pattern on the other!! Prima is looking beautiful on all the racks. Oh yeah did I forget to mention that we also got the new Sarah Kay christmas stamps, and some of the other new designers as well. If you like doodling templates then you really need to see the wonderful new 12x12 and 6x6 crafters workshop templates that came in!! There are so many exciting things happening at the store, guest designers copic certification and colouring classes, Kelley Grace will be coming to teach some classes in October. If you'd like to see some of her work you can have a peek at her website www.kelleygracedesigns.comkeep an eye out for our e-mails and future posts for more information. OMG!!! The prima and Basic Grey have made it to the shelves and they are just beautiful. you won't know where to look first!! We have been sooooo busy putting out stock, we've done almost nothing else. "I'm so excited to be teaching at Scrapbook Centrale.We are going to have so much fun playing with all the My Little Shoebox products plus all the other little goodies I am bringing with me. I hope you can make it and get ready for some fun!!!!!!!" Some of Prima was put on the shelves today and I have to say, I think I'm in love. The mixed crystal and pearls are just gorgeous. The new e-line flowers are really nice and very affordable. The pearl and crystal centers can be used as flower centers or on their own, they are that nice. Now as for Basic Grey, it is in the store.......in boxes. We are trying to get it out tomorrow. Also more prima! Cosmo Cricket is also in the store and it's a very fun line. Making memories halloween line seems to be all accounted for now and their christmas line is on it's way. Also we have had so many new page samples done by our very own Gen. She has been having fun playing with the new products (and my pictures) the 2 come together very nicely so please take a good look at the samples next time you're in the store, they offer some very original ideas and great uses for the new products. so much happening at SC!! besides all the new products coming in we have guest designers coming to teach classes. And yes we are having a copic certification class!!!!!!! Mark November 21st on your calendars because that's the date. But before that we have Suzy West coming and she has confirmed that we will have 2 different mini album classes and 2 different layout classes. Above are 3 of the layouts from the little ladies class. I don't know about any of you but I'm signing up for this one!! I've also included some pictures from the mini album classes. Now is the time to sign up. So, I just hung up with Suzy West and she is very excited about coming to Montreal. She just told me about her classes and they sound like so much fun that I think I will take them all myself. We will offer 2 different layout classes, one chipboard/acrylic album and one chipboard binder album that she has some fun techniques planned for. She talked about sewing on a layout, inking, painting, layering , pop dotting(if that can be used as a verb) covering an album with glossy accents etc..... she seemed to know what she was doing. She will also be bringing samples of other projects to the friday night crop. She also mentioned giveaways and lots of fun. So if you want to have a great time, learn lots of techniques, and get lots of product then you must give these classes a try!!! Now as for an update of new products. Dream Street Papers Sam line is in stock, these have the cutest little owls. American crafts papers and new glitter buttons, pearl brads , thickers etc... are all out for sale. The newest SEI lines are beautiful!!! Reminisce's new safari, christmas, halloween and fall lines are all in stock. They have some of the cutest little reindeer in the christmas line and squirrels and deer in the fall line, one look and you may fall in love. They also have a very glittery christmas line. Speaking of glitter have you tried the best creations glitter papers... they are a little pricey but those who have splurged have come back for more. The glitter stay on the paper!!!! how original is that. Now this week we will be putting the newest cosmo cricket lines out and Prima is showing up slowly but surely. They have amazing pearl centers and say it in pearls swirls as well as the Prima e-line, a very reasonably priced line of flowers, pearls and crystals. Their newest art stitches papers are in too. I was not a big fam of these until I used them in my acrylic album(sample at the store). I cut one up and used only a part of the sheet and the stitching just looked so exceptional on the acrylic. Prima's paintable overlays are great too, especially when colored with the very popular copic markers. Did I mention Copics, then this would also be a good time to mention that we will be hosting a Copic Certification Class in November. The talented Sherrie Siemens, designer with Copic Markers, will be joining us to teach this class. For more info you need to send an e-mail to narianne at ilikemarkers.blogspot.com requesting an application as soon as it comes available. Last but certainly not least....Basic Grey will be arriving this coming week. Don't miss out, it's like christmas already at the store. Start your gift making and card making early this year so that you are not stressed as the holidays approach. All you stamp lovers better start saving your pennies especially if you love christmas stamps as I have just ordered many of the cutest christmas and winter stamps!!! Tons!!!! 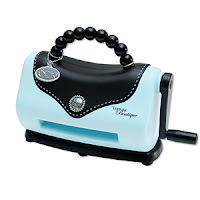 Sizzix has just brought out the cutest little embossing machine. If you are always admiring the cuttlebug but find it a little costly for just embossing then The Texture Boutique is for you! It's very affordable and adorable too!! Then for you die hard die cutters, the BIG SHOT PRO is the way to go. It cuts full 12x12 sheets. At the moment the majority of the dies are for bags and boxes but they will be devemoping many more for CHA winter. I took a class today where I made a waterfall clear album. I loved working with the acrylic. I hadfun with the copics, prima bling, and many other things, so I suggest you look at clear acrylic through new eyes, I know that I will. I saw Tim Holtz and we talked about his new distress stickles. 17 new colors!!!!!! I took a class with Hero Arts and I think that the white opaque Staz-on has just become my new best friend. There is so much more to tell you, I will be bringing as many samples home as possible and you know how I love to show those off!!!! 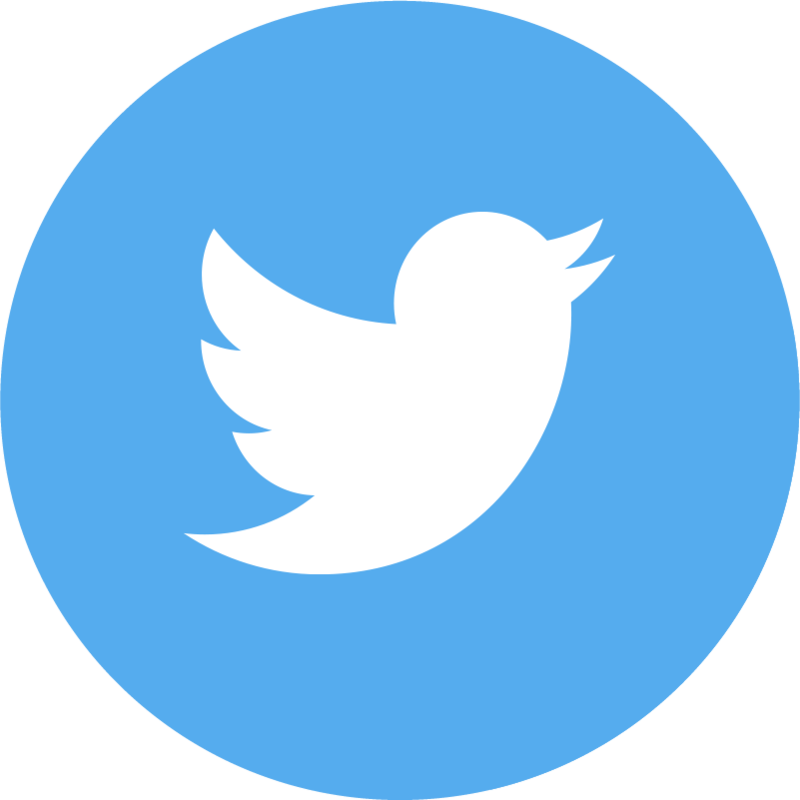 I will try to post more news tomorrow. Hi from hot and humid Florida. Well I just spent the day in a pre show and I got to see a lot of fun stuff. My Mind's eye has given me samples, what great lines these are. I saw Reminisce and some of their lines are so cool. The safari line has textured animal papers that are really neat. There are 2 halloween lines and 2 Christmas lines and then their autumn bliss line has the cutest little animals. Fancy Pants rocks as usual. American crafts has a huge great line, but I haven't seen it up close yet. Making Memories has a beautiful Christmas Line and their glitter embellishments are sooooo nice. They also re-did the slice. It's now pink(for breast cancer), 50% faster and their new design cards have 2400-3500 images per card and you can do mirror and shadow images. We hope to demo this at our demo bar very soon. Well there is still more work to do and much more to see so I will continue to keep you posted on our progress. By the way I hope that you have all been seeing some of the sneek peeks. Some of them are really wonderful. I especially like My Mind's Eye and Bo-Bunny, American crafts looks like it's going to be great too. I saw Best Creations but that is usually better up close.I will try and keep you up to date as I have more information. Remeber send your wish lists early to be sure I know what you want from CHA!! 3 bugs in a rug, I think it's adorable. You can see it on their site www.3bugsinarug.com . 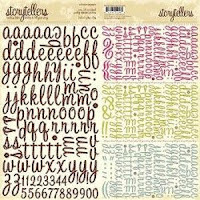 Now I am working on my Stamping Bella order. Those stamps are soooo cute. I can't wait to have the new ones in the store and then I need my fix of KETTO's (especially Tatiana, my personal favorite) Next I think I will order the My Mind's Eye, also looking pretty nice. At this rate I won't even have to go to CHA, like that's ever going to happen!!!! Off to do family stuff and then back to work. By the way I will be accepting any and all wish list's for new companies to carry.